All five major indices I follow closely are all trading below their 200D SMA. 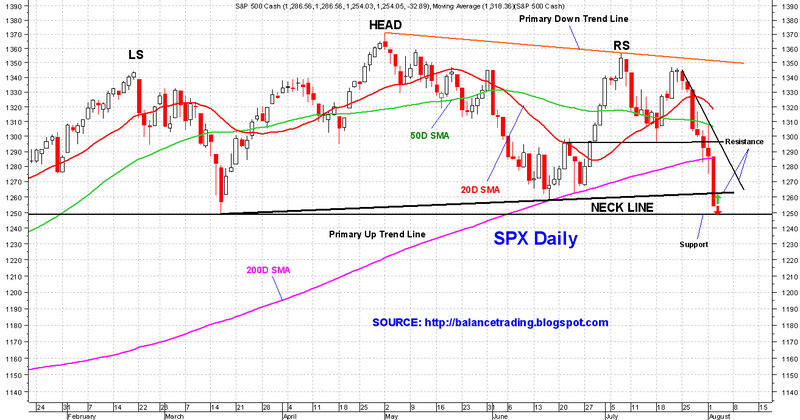 Additionally SPX closed below the Neckline today, confirming the H&S price pattern for SPX. The objected price for that pattern is SPX 1150 to be achieved sometime in late August to early September. DJI, RUT and DJT are exhibiting signs of being oversold on their daily charts now. 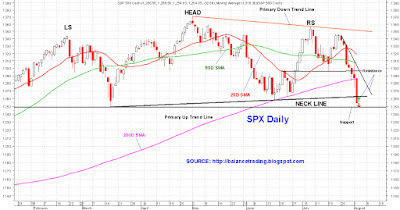 Indices, however, can continue to go lower for many days or weeks even after being significantly oversold. In fact an oversold condition is a necessary prerequisite for a crash. If selling continues for a few more days, Market would be dangerously close to a major one day correction / crash, something between 3% to 5% drop with an intraday drop of 5% to 8%. Considering the US and global economy at this point, only an aggressive action by the Fed can turn the market around. Short of that, the Chinese water torture would continue until capitulation.